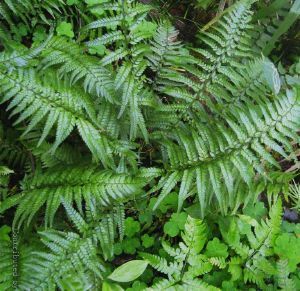 Polystichum tsus-simense, a Japanese species with evergreen deep green fronds. ‘Holly Ferns’ are one of the hardiest ferns around and are ideal for evergreen colour in shady spots in the garden. This particular species is neat and low growing,and has pale green fronds with dark veins and stems. The leaves acquire a silvery sheen as they age, but this simply adds to the plant's interest.